With talks between the BJP and the Uttarakhand Kranti Dal (UKD) on seat sharing having failed, the possibility of a pre-poll alliance between the two for the five parliamentary constituencies in the state has ended. The BJP leadership has made clear that it is “extremely unlikely” that the party’s central leadership will give one seat to the UKD. In what comes as a big jolt to the ruling Bharatiya Janata Party (BJP) ahead of the crucial Lok Sabha elections, Munna Singh, the estranged party legislator from Vikasnagar in Dehradun district, submitted his resignation from the party, here this evening. The agitation by councillors of the Haridwar Municipal Committee turned violent today after the condition of two ward members worsened. One of them had to be referred to a hospital. The stir has entered its ninth day today. Speaking on the sidelines of Rashtriya Kranti Dal (RKD) workers’ meeting held at the Municipal Corporation here today, the Dal president Maulana Masood Madni termed the treatment meted out to BJP’s Varun Gandhi by Uttar Pradesh Chief Minister Mayawati as appropriate. He said no leader had shown courage to take action against leaders indulging in hate speeches in the past. A section of the District Bar Association has warned certain members against aligning with political parties during the upcoming Lok Sabha elections. Notably, the Bar Association here is divided into two groups that are supporting rival political parties - the BJP and Congress. At a meeting held today, Uttarakhand Kranti Manch leaders took strong exception to the recent statement by Samajwadi Party candidate Ambrish Kumar on the hill-plain issue. A high-level meeting to discuss security arrangements for the upcoming parliamentary elections was held between officials from Uttar Pradesh and Uttarakhand, here today. Ban on the usage of plastic material for poll campaigning under the new election code of conduct has come as a big relief to state's environment. Most schools in the city, that reopened today, have left a hole in the parents’ pocket. Residents are agitated over the ever-changing uniform code and syllabi. With the arrest of Kulbir Singh, the police today claimed to have solved the murder case of Ram Singh, whose body was recovered from the Parade Ground on March 12. The Roorkee police claimed to bust a gang involved in printing and circulating fake currency with the arrest of five of its members here today. Uttarakhand will host its first national-level kayaking, canoeing and rafting competition in October at Bhimtal in Nainital district. Uttaranchal Kayaking Canoeing and Rafting Association (UKCRA) was given the responsibility of holding the competition by the Indian Kayaking and Canoeing Association. Gush Cricket Club of Delhi has won the 2nd Uttarakhand Cup. At the final played at Rangers Ground today, Gush Club beat Doon Tiger Cricket Academy. Manav Sharma bagged the Man of the Series award and Ankur Julka was declared Man of the Match. With talks between the BJP and the Uttarakhand Kranti Dal (UKD) on seat sharing having failed, the possibility of a pre-poll alliance between the two for the five parliamentary constituencies in the state has ended. The BJP leadership has made clear that it is “extremely unlikely” that the party’s central leadership will give one seat to the UKD. In response, UKD leaders have also announced that the party will contest all five seats on its own. Even as the BJP had announced candidates for all five seats, talks of a possible tie-up were on, with the UKD demanding the Tehri and Nainital seats from the BJP. The BJP had announced that its state president, Bachi Singh Rawat, would contest from Nainital and ace shooter Jaspal Rana from Tehri. Even though chances of the BJP leaving even a single seat for the UKD were slim, talks between the two were on. Putting an end to speculation, Bachi Singh Rawat today said they had sent a letter to the party’s central leadership regarding the UKD proposal. The UKD, which spearheaded the statehood agitation in the nineties, is a partner in the Khanduri-led BJP government in the state. It has three legislators in the assembly. In the last Lok Sabha elections, the UKD had fielded candidates from four parliamentary constituencies — Almora, Haridwar, Tehri and Nainital. It had managed to secure a total of 43,899 votes. In what comes as a big jolt to the ruling Bharatiya Janata Party (BJP) ahead of the crucial Lok Sabha elections, Munna Singh, the estranged party legislator from Vikasnagar in Dehradun district, submitted his resignation from the party, here this evening. 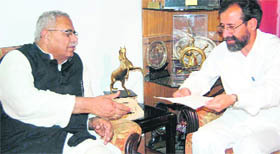 He also submitted his resignation from the Uttarakhand assembly to the Speaker Harbans Kapoor at his residence. Munna Singh Chauhan was feeling uncomfortable in the party ever since he had joined the BJP ahead of the assembly elections in 2007. Earlier a legislator of the Samajwadi Party in Uttar Pradesh, Munna Singh resigned from SP to form his own political outfit - Uttarakhand Janwadi Party (UJP). But his party, including he himself, was routed in the first assembly elections held in February 2002. He later merged his outfit with the BJP before the 2007 assembly polls and won the election from Vikasnagar segment. However, from the very outset, his relations with BJP leadership soured, as he wanted his wife Madhu Chauhan to be given a party ticket from the adjoining Chakrata assembly segment. When denied, his wife fought as an Independent, much to the chagrin of the BJP leadership. She lost, but assured that the BJP candidate came third. After the formation of the BJP state government, Munna Singh was sidelined and not given any ministerial berth. The relations between him and the BJP leadership deteriorated further during the panchayat elections held in October 2008. Madhu Chauhan won the elections to the post of chairperson of the Dehradun Zila Panchayat despite every effort by the ruling BJP to defeat her. Since then Munna Singh has been vocal against the BJP and also held a meeting with Bahujan Samaj Party (BSP) chief Mayawati. "I had joined BJP to do some constructive work for the people, since it was a national party. But I was thoroughly disappointed," he said. However, there is no danger to the state government led by Chief Minister BC Khanduri, as he enjoys the support of the three members of Uttarakhand Kranti Dal (UKD) and two Independents. Notably, the BJP has 36 members in the 70-member house, including the Speaker. The state also has a nominated member. It is also believed that Munna Singh would now contest from Tehri Garhwal seat as a Bahujan Samaj Party (BSP) candidate. But he refused to divulge any details today. In case he does contest as a BSP candidate, it would change the entire poll scenario in Tehri and things are likely to get tough for BJP candidate Jaspal Rana. Both Jaspal Rana and Munna Singh belong to Jaunsar area of Chakrata region of Dehradun district. The councillors are staging a dharna in the premises of the municipality against the hike in the fares of the ropeway service, being operated by a private company, to Mansa Devi temple, which is atop a hill here. Today was a hearing in the case in the Supreme Court in which the lawyer representing the municipality had remained absent. This infuriated the agitators who termed it as a deliberate attempt on the part of the municipal chairman who is seen as favouring the company. Irrespective of their party affiliation, councillors of the Congress, Bharatiya Janata Party, Samajwadi Party and Bahujan Samajwadi Party were united in the cause. The protesters, on seeing that the health of Jwalapur ward member Vineet Malik was deteriorating, became angry. After referring Malik to the hospital, they went to executive officer (EO) of the municipal committee Harshwardhan Sharma’s house and entered forcefully. They even mishandled an attendant and abused the EO blaming him and municipality chairman Kamal Johra for the situation. The members demanded that the gate of the ropeway company be immediately “seized” by the administration. They forcefully took the EO along by foot to the company office to “seize” the gates. As the palika members were raising slogans, many of their supporters joined them. This created quite a scene in the city. Samajwadi Party state chief Ambrish Kumar, who is a candidate for the Haridwar Lok Sabha seat, also accompanied the agitators. Though CO City Navneet Singh and City Magistrate Archana Gaherwar tried to pacify the councillors, they paid no heed and continued to charge to the ropeway company’s office. On the direction of the police, the company shut down the ropeway service and locked the gates. After an hour of slogan shouting, the EO was forced to “seize” the gates of the company and then was taken back to the municipal office. When the municipal employees saw the protesters misbehaving with their EO, they opposed the ward members’ behaviour. The municipal employees boycotted the work and have demanded that until the ward members are punished, they would remain on strike. Meanwhile, the police cordoned off the whole municipality office area to prevent further skirmishes. Kamal Johra has termed this incident as unfortunate and said that he was looking into the matter and will take necessary action. Till the filing of the report, no police case had been registered. Harshwardhan Mishra has expressed shock on the rude behaviour of the members and asserted that it was not the right way to protest. The ward members are opposing the hike in fares from this season. They say that the current fare of Rs 48 is too much considering the contract between the municipality and the company on the fare list. The ward members stated that the municipality has become ineffective in controlling the fares. The Usha Breko Ropeway Company had in May 1974 signed an agreement with the Haridwar municipality in which rule 9 states that the company can increase fare in consultation with the municipality. If both sides don’t agree, then with the help of arbitration and consultation, action can be taken. Later, it was decided that every five years, the company will increase fare by 25 per cent. At that time, the fare was Rs 2 per person. In 1996, when the fare was increased to Rs 20, there was opposition from several organisations. Despite this, there was an agreement between the then palika chairman Raj Kumar Arora and company officials that every two years, the fare would get a hike. In December 2004, in a board meeting under Municipal Committee Act 1916 Section 94, the supplementary agreement was dismissed against which the company went to the High Court. The company’s writ petition was dismissed by the High Court in April 2006. It appealed to the Supreme Court where a hearing was to take place today. Speaking on the sidelines of Rashtriya Kranti Dal (RKD) workers’ meeting held at the Municipal Corporation here today, the Dal president Maulana Masood Madni termed the treatment meted out to BJP’s Varun Gandhi by Uttar Pradesh Chief Minister Mayawati as appropriate. He said no leader had shown courage to take action against leaders indulging in hate speeches in the past. “In my opinion he should be confined to jail for at least a year. His confinement under NSA has set an example for rest of the BJP leaders who indulge in communal politics and try to divide voters on religious lines. “There was no report of any communal flare up in the last few years, but if BJP leaders continue to indulge in hate speeches the situation can exacerbate,” he said. 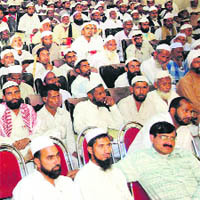 Meanwhile, Maulana Madni informed that they would be contesting from all five constituencies in the state. “Our candidates would be contesting for all five seats. Mufti Akbar would be fighting from Tehri, Mufti Yadi Elahi from Haridwar, Quari Zakir Hussain from Nainital and Zulfikar Ali from Pauri. We have not finalised the name of the candidate from Almora-Pithoragarh yet,” he said. A former Congress man who served as a state minister in the previous government, Madni changed ranks prior to the 2007 state assembly elections and created the Maidani Kranti Dal. Although the party failed to win any seats, they damaged the prospects of Congress in some constituencies. Now heading a new political outfit, the Rashtriya Kranti Dal, Madni claimed that he had the support of Muslims, the poor and the Dalits from all communities. “We have a dedicated cadre of voters from our community and we hope to get support from other communities as well. “Both the Congress and the BJP have failed to protect the interests of the poor and downtrodden,” said Madni. He said after the elections they would focus on strengthening the party base in other states as well. This has made its functioning difficult. In a meeting held today, the lawyers said such politicisation is impeding the work of the Bar Association and threatened to form a new body if this is not stopped. Recently, the association president Pradeep Jagata held a meeting of advocates and urged them to support Congress candidate Harish Rawat. On the other hand, former Bar chief Ravindra Datta held another meeting and urged the members to vote for BJP candidate Swami Yatindranand. “This is quite amusing. These leaders are dividing advocates into groups, which is not right. The Bar is for welfare, not for propagating any political party’s agenda,” said senior advocate Sewa Ram Azad. The advocates have also warned that if the situation does not change, they would seek the removal of such leaders. Others present during the meeting included senior legal practitioners Uma Kant Chaubey, Ram Singh Saini, Devendra Chauhan, Narendra Saini, Yogesh Sharma, Uma Dutt, Dinesh Gautam, Virendra Pratap et al. The Manch leaders said the comments by Ambrish Kumar are unwarranted, and are not in sync with the peaceful cultural diversity of Uttarakhand. JP Pandey, national president of the Manch, alleged that earlier Ambrish had raked up the Uttar Pradesh-Uttaranchal issue when the state was being formed and now he is trying to create the hill-plain divide. “With Harish Rawat contesting from here, the SP is on the backfoot and therefore trying to play such games,” said Dr Ahitan of the Manch. The meet was chaired by Garhwal Commissioner Umakant Pawar, with Saharanpur Commissioner RP Shukla holding the co-chair. Both the states have decided to intensify patrolling on the border 48 hours prior to the polling day on May 13. Regarding the area that falls on the boundary and where there are no main roads, it was agreed that electoral lists would be thoroughly checked to lessen the chances of double voting. Both states have also decided that they would exchange details regarding criminals and history-sheeters so that they are under constant watch. Under the code, putting up banners or party symbols on trees or any geographical feature like hills has been banned. Flags made of polythene, which were used earlier, will also not be allowed. Welcoming the ban, environmentalist Kalyan Singh Rawat said the green cover in the state should not be tampered with. 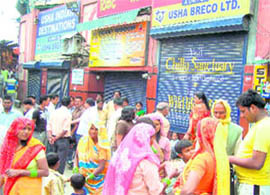 There are long queues at shops selling uniforms and books. Parents are forced to bear unnecessary expenses to meet schools requirements, like the dress code, that keep changing every academic year. Prashant Kumar, a harassed parent said: “I have to buy new uniform from shoes to the school tie. The school has changed the uniform altogether. These private schools are exploiting us just because the standard of education in government schools is bad. Said Deepa Shah whose daughter is in a public school, was irked at the repeated change in the school house dress for the last three years. “ Spending on something which can be done away with is irritating,” she added. If this was not enough, a Dehradun school has asked its students to replace their blazer buttons with the one which had the school hologram engraved on it. Each button costs Rs 5. There is a school in town that follows three different dress codes for pupils in different classes. A shopkeeper said the school indulged in such practices to earn commission and to benefit a particular shopkeeper. The accused has confessed that he had murdered Ram Singh because the latter an illicit relation with his wife. Kulbir, who is resident of Uttarakashi, was arrested this afternoon while he was passing by the Parade Ground. The SHO of Dalanwala police station and investigating officer of the case Santosh Jaiswal said the police was tracking Kulbir’s movement since the past couple of days. Jaiswal said the accused had called Ram Singh to the Parade Ground on March 11. A scuffle had ensued between the two, following which Kulbir repeatedly attacked Ram Singh with a stone. This led to the latter’s death. During interrogation, Kulbir also confessed that he had killed a vendor, Rajkumar, from Chamoli in 2004. Although officials at Kotwali police, where the case of Rajkumar’s death was registered, confirmed this, the Dehradun police is now trying to verify the facts. Meanwhile, a case under section 302 of the IPC has been registered against Kulbir. He will be produced in court on April 3. Roorkee: A decomposed body, identified as that of Ashok Kumar (aged around 30 yrs), hailing from UP, was today recovered from a field at Libberheri, around 15 kms from here. The police said Ashok had been missing from Delhi since March 15. A report in this regard has been lodged at Keshavpuram police station. The victim was a driver in a Delhi-based transport company. The police also recovered three driving licenses, a PAN card, a letter and three photographs from the pocket of the deceased. Meanwhile, the body has been sent for postmortem and DNA tests. Apart from arresting the miscreants - Nada alias Rizwan of Sultanpur Kunheri village, Khurshid, Mussawar (both residents of Mohammadpur Kunhari village), Shyam Singh from Kankhal and Rajvir, a resident of Shimla - the police also seized fake currency worth Rs 2 lakh and a laptop, two digital cameras and a laser printer, which was used to print the counterfeit currency. However, the gang leader, Munna, managed to evade the police. Ajay Joshi, SP (rural), said, “The suspects started printing the currency at Shyam Singh’s house around six months back. They themselves put these fake notes into circulation in the villages in the area.” On a tip-off, the police sent a decoy customer at Sultanpur Kunheri village to get the currency from a gang member following which the police made the arrest. A case has been registered. Uttarakhand will host its first national-level kayaking, canoeing and rafting competition in October at Bhimtal in Nainital district. Uttaranchal Kayaking Canoeing and Rafting Association (UKCRA) was given the responsibility of holding the competition by the Indian Kayaking and Canoeing Association. Secretary of the association, Alaknanda Ashok, said that the competition would be divided into five categories - men, women, junior, sub-junior and girls. It proved to be a one-sided final as Gush Cricket Club registered a thumping eight-wicket victory. Batting first, Doon Tiger Cricket Academy went on to score 186 runs in their allotted 40 overs. Doon Tiger Academy’s batting began on a shaky note as it lost both openers at the score of six runs. Bageshwar Bisht was the leading run-getter for the team scoring 61 runs off 92 balls. No other batsman stayed at the crease for long to support Bageshwar. Tail-ender Shekhar was the second-highest scoring batsman for the team. He made 20 runs. Disciplined bowling by Gush bowlers dried out the boundaries for Doon Tigers. For Gush, Sandeep Sharma was the leading wicket-taker. He picked up three wickets in his eight-over spell. Shoaib and Sarabjeet picked up two wickets each. In reply, Gush Cricket Club reached the target in just 25.4 overs with eight wickets in hand. The openers gave a flying start as they contributed 152 runs for the opening wicket. Anukur was the top scorer for the team with 85 quickfire runs off 58 balls, smashing 13 fours and two sixes. Sagar Sandhu scored 61 runs off 59 balls. For Doon Tigers, Sanjeev took two wickets. Gush Cricket Club won a prize of Rs 51,000 while runners-up Doon Tigers got Rs 21,000.